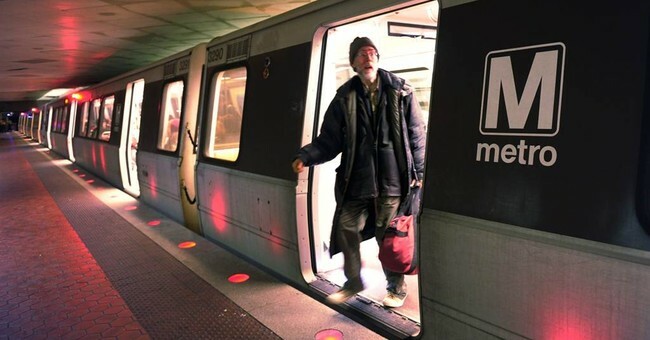 The Washington, D.C. Metro system stinks. A stench of mediocrity and failure wafts up from nearly every escalator in the city as the trains below halt to a screech, seemingly never on time. But, according to one D.C. councilman, that is not exactly the fault of the Metro system. No, D.C. Councilman Jack Evans (D-2) says it is largely because of companies such as Uber & Lyft taking all their riders and therefor the public transportation system's money. “Uber and Lyft are part of the transit system here, and so they should help pay to fix Metro because they’re benefiting from Metro’s demise,” Evans told The Washington Post after D.C. Mayor Muriel E. Bowser introduced new taxes on the ride-sharing companies based largely off his advice. According to the Post, the new taxes have the potential to add 47 cents on to each $10 ride. When D.C. Mayor Muriel E. Bowser proposed taxing Uber and Lyft to raise money for Metro, she was turning to an increasingly popular approach to pay for public transit improvements. However, compared with other cities and states that have used the model, Bowser’s 37-cent additional fee on each $10 trip would be among the most radical examples of raising tax revenue for transit through ride hailing. Bowser’s proposed $14.5 billion budget for the fiscal year that begins Oct. 1, would increase a 1 percent fee on ride-hailing trips to 4.75 percent, tapping into a revenue source known as the “gross receipts tax” to pay for about 10 percent of the $178.5?million in annual funding the city has pledged for its share of the Metro funding package. In practical terms, that means a rider who now pays a dime in taxes on a $10 ride would pay 47 cents under the mayor’s proposal. But as the Post notes, this reasoning contradicts previous statements by Mayor Bowser in which she said the decline of riders on the metro is largely because of inherent problems within the system, not due to competition. Furthermore, the companies add that these taxes will harm customers. Especially ones who live far away from metro stops. “But the companies, all of whom say they support dedicated funding for Metro, say the tax increase could result in them raising fares for their customers. The additional surcharge on UberPool fares, for example, could be particularly noticeable for users of lower-cost ride-sharing option UberPool. Ride hailing has become more competitive with public transit as companies have rolled out lower-cost pooling and ride-sharing options enabling passengers to split the price of a ride. In some instances, the costs of rides are lower than the comparable Metro fare. To that extent, Councilman Evans retorts, “My advice to their lobbyists when they called me is, what you should say is, ‘We are happy to do our share.’ If they’re complaining, tell them they’re lucky I didn’t take them to 6 [percent] — and maybe I will," according to the article. Councilman Evans, to his credit, has often argued against spending unnecessary money on items such as the DC streetcar expansion. The original implementation of the DC street car on H street cost more than $200 million. But, based on the proposed budget, it is unclear to Lyft President John Zimmer how exactly Evans plans to help improve the metro system. "At a roundtable with reporters in Washington last week, Lyft President John Zimmer said proposals that discourage people from using ride-hail services, which can operate more cheaply than transit, are a potentially “dangerous” proposition. On a more basic level, he said, taxing ride-hailing services does not address the root cause of the problem.